I finished reading The Charismatic Century, by Jack Hayford (with S. David Moore, author of the very thorough The Shepherding Movement), and as requested by KSG, here's a few thoughts on the book. I think a quote from the late John Wimber actually might serve as the thesis statement of this book: "Take the best and go!" Hayford and Moore do an admirable job of tracing the history of North American Pentecostals, Charismatics, and Third Wave movements in a very engaging and readable style. 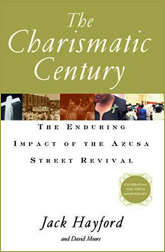 While acknowledging the charismatic-like movements that occurred independently in other countries -- at times pre-dating the Azusa Street Revival of 1906 -- the focus is largely on the roots and fruit of the Azusa event. Keeping the quote from Wimber in mind -- "Take the best and go" -- the book is helpful in tracing the history of early Pentecostalism, the Charismatic Renewal, and the Third Wave. While some controversies are acknowledged (the Oneness debate, the Shepherding Movement, the Latter Rain), it may appear as though Hayford and Moore are letting them "off the hook", so to speak, by not going into greater detail on some of the problematic teachings. For example, William Branham is acknowledged as having developed some "erratic" teachings towards the end of his ministry, but that's about it. Branham is mostly viewed as a significant personality in the era of the healing evangelists; the only other healing evangelist who gets more than a passing mention is Oral Roberts. As someone who has researched Branham in more depth, I was a little disappointed that he seemed to get a "get out of jail free" card, as a significant number of teachings from Branham are -- to be charitable -- highly questionable at best. Likewise, the Latter Rain movement from North Battleford, Canada gets a brief mention, but the teachings that led to its denunciation by other Pentecostals aren't even mentioned. However, if we keep "take the best and go" as the lens for viewing this book, and recognize that the authors never intended nor claimed to be writing a theological critique or defense of various streams of thought, this book is both encouraging and helpful. If it's a critique of charismatic theology and/or excesses that you're looking for, this isn't your book. However, if you'd like a good historical primer which highlights, well, the "highlights" and invites you to consider how you might "take the best and go", then I would recommend The Charismatic Century. The "Christmas truce" is a term used to describe the brief unofficial cessation of hostilities that occurred between German and British troops stationed on the Western Front of World War I during Christmas 1914. The truce began on Christmas Eve, December 24, 1914, when German troops began decorating the area around their trenches in the region of Ypres, Belgium, for Christmas. They began by placing candles on trees, then continued the celebration by singing Christmas carols, namely Stille Nacht (Silent Night). The British troops in the trenches across from them responded by singing English carols. The two sides continued by shouting Christmas greetings to each other. Soon thereafter, there were calls for visits across the "No Man's Land" where small gifts were exchanged — whiskey, jam, cigars, and the like. The artillery in the region fell silent that night. "The Lord is my shepherd. I shall not want. He maketh me to lie down in green pastures. He leadeth me beside the still waters. He restoreth my soul. He leadeth me in the path of righteousness for his name's sake. Yea, though I walk through the valley of the shadow of death, I will fear no evil." The truce spread to other areas of the lines, and there are many stories — some perhaps apocryphal — of football (soccer) matches between the opposing forces. The film Merry Christmas suggests that letters sent home from the war related that the score was 3-2 in favor of the Germans. A few thoughts arising from questions or insights that were shared in the comments to the Parachurch as Church post a few days ago, that I thought I'd respond to with this addendum. ...I guess what I'm thinking is that I agree with a lot of the sentiment, but I fail to see the longevity of the para-church as "church". It almost appears as church "for a time". But perhaps that's okay? But it might not be if when they get home there is no "para-church" for them to plug into. It kind of reminds me of the gap between those in youth groups who, when they graduate, don't connect with adult church. I really resonate with the last bit of your comment, Kyle; I've noticed many times that former parachurch people have a difficult time re-integrating into church. Blame gets shifted both ways on that one; parachurch is uncharitably portrayed as a hot-house spiritual high that doesn't reflect "normal" life, or the church gets diss-ed as being so dead that totally-alive parachurch ministry only reveals the deadness of the church, etc. That kind of blame-game doesn't do anybody any good (imo). I don't have a problem with the "season" idea of parachurch ministry; although perhaps we should note that it's not a 'season' for the staff of the parachurch. But even for those with short-term participation, it's their church for that season. And if it creates a greater hunger for authenticity, expectation of the work of the Spirit, and a desire for deep community with like-minded others -- even if that means that they're "ruined" for ordinary church -- I say, "bring it on!" You didn't include the appointing of pastors, baptism or observing the Lord's Supper in your comparison between a church and a parachurch ministry... perhaps you could comment on the reasons why, and how that fits in with what you're arguing here. Thanks for pointing out that side of it, Chuck. As Jamie Arpin-Ricci mentioned in the comments to the original post, there are a number of parachurch ministries that do practice baptism and celebrate the Eucharist together. Biblically, I can't find any reason why someone couldn't be baptized in a local pond by their Aunt Suzie and Uncle Jim-Bob, so I'd also extend that understanding to the parachurch's "right" to practice baptism as well. Remembering the Lord's death, burial and resurrection isn't something that I find that the Scriptures prohibit happening outside of some sort of "official" meeting. Again, it can be (and is) observed in house churches, liturgical churches, seeker-sensitive churches, etc., so I can't see any reason that para-churches couldn't also. "Appointing of pastors" is an interesting one. The first question that pops to mind is what makes a pastor "properly appointed"? I've been an ordained pastor (yes, I was "Reverend" Robbymac once upon a time), and I know that some denominations make a big deal of that in ways that make me, frankly, really uncomfortable (nay, weirded-out, freaked even). It was all about "the prestige of the pastoral position, and the reverence for those who had attained the office, etc., etc., etc". Like Jamie, I tend to see "pastor" as more about spiritual giftedness and function in a local gathering of the Body. Some with pastoral gifting get paid and are "clergy" according to Revenue Canada, and there's nothing wrong with that, of course, but I'm not comfortable with only paid clergy being seen as "real" pastors. I've been a pastor for 21 years, and I got paid for it for seven (non-consecutive) years out of that time span. The rest of the time I've worked in detention centres, as an outreach counselor for a school district, a shipper-receiver in a factory, a graphic designer, a bass player in a Celtic Rock band, and most recently as a barista at St. Arbucks -- but I've never ceased pastoring. All that to say, para-churches "appoint" pastors, but it probably looks a little different than a more traditionally-understood clergy position. I think, as Christians in the post-western world, we ought to embrace various forms of expression and and worship; the para-churches are doing just that, living for Christ in a place that isn't all too friendly to an exclusive claim to deity. Emerging Grace, thanks for the Barna stats. 2025 isn't really all that far off! And judging by the many conversations I've had in the analog world, as well as the blogosphere, we may be closer to Barna's projection right now. "But by 2025, Barna writes, just one third will have their primary attachment in a traditional congregation, and a like number will be connected with alternative forms of church. He notes that these forms are still emerging, but already include house churches, informal worship gatherings, small/accountability groups, and service ministries and parachurch organizations." I look forward hearing your input on these, as well. Thanks for helping to sharpen my thinking! Has anyone else noticed that it's impossible to nail something to a blog? Or even harder to nail something to a computer screen? Has anyone learned this lesson through unfortunate and rueful happenstance? I've never had much of a "commenting policy" here. Honestly, with the exception of the occasional troll shuffling by, it's never really been much of an issue. People here have generally been respectful, thoughtful, and I've always been grateful for that. Nobody can be sent to hell for voicing their honest opinion. True, when in youth/young adult ministry, this meant that at times we had to patiently endure some questionable ideas as people worked out their salvation with fear and trembling (Philippians 2:12), but creating a "safe place" that was "safe" for everyone -- even those who belonged but did not yet believe -- was worth it. Same goes for this blog. We listened to you with respect, so (of course) you will listen to others with respect. Should be a no-brainer, but just so it's said: When iron sharpens iron, sparks sometimes fly (Proverbs 27:17). But there's a difference between spirited conversation and the typical troll-like behaviour of, well... trolls. Normally, in an "analog" situation involving youth and young adults, I'd say at this point: "One at a time, people, one at a time!" But blog visitors are so mature and respectful when it comes to taking turns, looking to the interests of others (Philippians 2:3-4), that it really isn't necessary here. No plastic, super-spiritual-wanna-be, Sunday School-ish, Christianese-based, jargon-infested clap-trap. Please and thank-you. In the comments to the previous post, Near/Far: Second Iteration, vocalist/guitarist of the band Wayfarer, Ryan Chubb, asked some questions that sparked more thoughts on my behalf, and when I realized my answer to him was post-length in itself, I decided to make it an update to the original post. And now it's a post all on it's own. "My question is how do we define these things? What is passion if many equate it as exuberance? How do we avoid forced-to-a-predetermined-conclusions without making it a complete existential free-for-all?" I guess what sparked my choice of words (which are admittedly and deliberately provocative) were instances where I've witnessed it. For one, visiting a prominent mega-church and observing that they have little golden "mood lights" above the congregation, which rise and fall in luminence in connection with the rise and fall of the music, and seem to be designed for the express purpose of causing a corresponding rise and fall in the "mood" of the congregation. I believe they typically call this a "worship experience". At first, I would have simply called it beaucoup de fromage (extemely cheezy), but ultimately (as I saw more and more youth ministries and churches adopting the same methodology and language) it bothered me because it's contrived, not real, not from the heart, and definitely pre-packaged. In which case, I would more likely just call it what it is: "manipulation". Second, in some (not all) worship gatherings of charismatic, pentecostal, third wave and -- yes, let's admit it -- YWAM people, I have oft-times observed somebody (whether a leader, worship leader, or well-intentioned young person with a "word") say something to the effect of: "If you're not dancing, you're not 'free'. If you love God, you must dance for Him (right now)." With the unstated condemnation that, up until that moment, God wasn't happy with our worship, and that if we don't dance right now, we don't truly love Jesus. Let me be really, really, REALLY clear: I absolutely LOVE freedom in worship, but to me, "freedom" looks more like a creative diversity of worship expressions, not the uniformity of one posture dictated by the agenda of the few. Just before the most recent occurrence of this mentality, I was thoroughly enjoying singing Redman's "Blessed be the Name of the Lord" (great lyrics to this one! ), and all around me, people were singing, some kneeling, some dancing, some with hands in the air -- a wonderful picture of the Body being free to express different creative postures of worship in a corporate setting. Then, of course, there was the "word" about dancing for Jesus, and the requisite playing of "Undignified", and suddenly the worship of Jesus felt highjacked by a human agenda. Let's face it: some people don't find dancing to be part of their repertoire of worship expression. They just aren't dancers, and by forcing this narrow expectation on them, their focus is taken AWAY from worshipping Jesus, and placed on whether or not they were performing according to an agenda. Secondly, and even more serious, is that these kind of "dance or you don't love God" kind of statements actually misrepresent Jesus. Can you imagine this scene playing out in the heavenlies? Angels: "Jesus, look over there! We see a whole crowd of Christians, from many different countries, language groups, denominations, and generations, all joining together to worship You! Isn't it awesome?" Jesus (totally losing it): "Oh no, not again! They're doing it ALL WRONG!!. Quick, Holy Spirit, goose somebody down there to tell them that they don't love Me unless they're dancing." Manipulation in worship -- although I'll concede that there are times where it's actually unintentional -- is a trap that anyone involved in worship has to be aware of, and guard against. So, Ryan, when I posed the original statement which provoked your very excellent questions, it was these kind of things in the back of my mind that prompted what I wrote. Bill Kinnon has written a very good and thought-provoking article after being a part of this discussion here. Check out Bill's The Power of Music in Church. My first reaction when I came across this phrase, frankly, was that it seemed incredibly sexist. What makes the church feminized, and why is that seen as bad, a mistake, or substandard? Sometimes, it sounds like we're being forced to look at worship and worship songs like the above picture. Why the forced dichotomy? Particularly such an over-stated forced/false dichotomy as masculine "versus" feminine worship? The more I read what people seem concerned about, however, the more it sounds like people are actually reacting against pre-packaged, emotionally-manipulative, forced-to-a-predetermined-conclusion, passionless programs masquerading as worship. And let's face it -- there are worship leaders and church leaders who appear skilled and deliberate with manipulation and pre-packaged "experiences" that are ultimately hollow and unsatisfying. And I'd be among the first to lead the charge out the door if that were the case. But equating passion-less worship with being too "feminine" only creates confusion and unnecessary offence. It's not about some fictional "genderization" of worship and church, it's about passion, or the lack of it. Connection with the Divine, or the lack of it. If intimacy with the Father is seen as too "feminine", or somehow substandard for the he-men of the 21st century, that says more about the men than it does about the worship or the church (and it's not a positive statement). "I think it's not so much "feminization," because then we're basically saying that feminine is wimpy and weak... I think it's just that we've turned Christianity into white bread and twinkies. 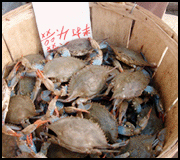 The gritty is taken out, the raw passion, the hungry searching." "If intimacy = feminized, which as one commenter said, seems to be used as a synonym for "weak," then we would have to discard many of the psalms and selected passages where the prophets bare their hearts to God in complaint or distress." Just a quick perusal of the Psalms reveals a very intimate relationship between David and Yahweh; David was a soldier, a king, and a worship leader, whose masculinity was not in the least threatened by telling Yahweh of his love for Him (ie. Psalm 18:1-3, Psalm 23:6, Psalm 36:5-6, Psalm 103:8-12). "The most important one," answered Jesus, "is this: 'Hear, O Israel: The Lord our God, the Lord is one. Love the Lord your God with all your heart and with all your soul and with all your mind and with all your strength.' The second is this: 'Love your neighbor as yourself.' There is no commandment greater than these." Jesus not only reinforced the acceptability -- nay, the assumption -- that intimacy with the Father is important, He goes beyond the Shema to add humanity to the equation as well (another topic with huge implications). Suffice it to say for now: worship that communicates and expresses a love for Jesus is not wimpy, feminized, or "an 80's thing". If the proliferation of sappy Jesus-is-my-boyfriend lyrics fail to adequately capture this biblical reality, the problem is with the songwriters and worship leaders who use these songs; maybe it's time we put songwriters' feet to the fire (so to speak) to come up with better ways of communicating. I've got some thoughts on how being a "fatherless generation" has changed in meaning and expression recently, and how that might impact this topic; more on that later. Recently, I've been running across comments and blog posts complaining about the "feminisation of the church", and not just from the Wild At Heart types. And I've also come across other sources decrying what they consider the vomitous drivel of worship songs which they categorize as "Jesus is my boyfriend" types of songs. And I have to wonder: why all the sudden Christian male fear of intimacy with God? After all, we're supposed to be enlightened 21st century dudes, aren't we? Not stuck in some wierd 1950's Leave It To Beaver kind of gender role assumptions? So what's the deal with saying that the church has been "feminized"? What's the preferred, more balanced, man-friendly alternative -- worship services modelled after a wrestling match or perhaps a tractor pull, with the platform adorned with flannel-draped power tools, and where the pastor looks like Tim "The Tool Man" Taylor, or perhaps that icon of Canadian manliness, (insert genuflection here) Red Green? I think the real issue behind this feminisation of the church and reaction to "Jesus is my boyfriend" songs -- which seems to include ANY song that speaks of loving Jesus (contrast with the Shema in Deuteronomy 6:4-5 and Mark 12:28-30) -- is the false dichotomy and pendulum swing between God's transcendance and imminence. When songs like Arms Of Love by Craig Musseau, or Father I Want You To Hold Me by Brian Doerksen (to name just two of many) were written in the late 80's and early 90's, they were addressing a whole element missing from much of our worship: that God was approachable, intimate, a Comforter and a loving Father. The pendulum up till this point had been more focussed on God's transcendence: His holiness, His complete Other-ness, His attributes, and the need for reverential respect (fear) of the Lord. In many church circles, these songs of intimacy were perceived as an attack on God's sovereignty, or at the very least, the watering down of an understanding that God is HOLY. And in some instances, there probably has been an over-correction, where God is now viewed as the Big Buddy in the Sky, or a feel-good hey-holiness-is-no-big-deal smilin' bobblehead, or even with the cavalier attitude of "Jesus is my homeboy". And perhaps we could start a contest in the comments to this post: "Syrupy Worship Songs That Send Me Into A Diabetic Coma". But this just represents the fringe element on the far side of the pendulum swing, which only serves to perpetuate the false dichotomy. But perhaps the pendulum is swinging hard in the other direction; just as the anti-everything crowd gets their knickers in a knot about the irreverence towards God, so the emerging conversation has an element that seems to want to put God back in His unapproachable, unknowable, unlovable transcendent place. Respect? Sure. Wonder? Okay. Mystery? Cool. Intimacy? Not at my tractor pull, buddy! We need to learn to be comfortable in tension; radical middle people who can hold in one hand the idea that God is holy, righteous, soveriegn, just, and to be held in a deep reverential respect (fear of the Lord), and hold in the other hand the reality that, as Jesus told Philip, "if you have seen Me, you have seen the Father", and then look through, say, the Gospel According to St. John, and see just how Jesus modelled the heart of a Father who loves, cares for, blesses, and comforts His children. There is no biblical reason we should have to separate God's imminence and His transcendence; it's a false dichotomoy. This post is getting long, so I'll stop here for now, but I think I'll be unpacking this one a bit more in the next couple of days. In one of the most creative geek-speak-meets-Humphrey-Bogart blog entries ever, Tall Skinny Kiwi Andrew Jones details the heartbreak of A Technorati Scorned. Creativity -- ya gotta love it! Blog it again, Sam. Long before George Clooney uttered these classic words in Oceans Eleven (apologies to those who prefer Sinatra's version from 1960), the concept of "are you in" was explored in a much more visceral, gut-wrenching way by some of the big names of the Old Testament. Daniel and Nehemiah are examples to us today in their willingness to be "in" with a bunch of people who kept screwing up their nation. You can see it in their prayers. And most significantly, although they weren't the cause of the problem, they assumed a posture of identification with the rest of their people and with the plight of their people. It strikes me, after reading these two prayers, that both Nehemiah and Daniel have hit upon something of great spiritual importance that we need to consider in our journey to recapture what it means to be the Church, in partnership as a missio ecclesia with God the Spirit in His missio dei of the advancing Kingdom of God. Simply put, I don't think we have the authority to proclaim that the "institutional" church isn't "us". The more I look at the whole topic of detoxing from church, the more I'm getting uneasy with the idea that we can just write off a large segment of the church. What if identifying with the church at large -- mega, seeker, purpose, charismatic, fundamentalist -- is part of God's missio ecclesia? Is there a spiritual component to choosing to identify with the church at large, which we will miss out on if we don't (or refuse to) make that choice? What if the freedom to choose to identify with the church (including our own CLB) is an indication of a returning spiritual health for those going through the season of detox? I've mentioned here before that St. Larry of Norman is my radical-middle patron saint. My very first Larry Norman album was Street Level, which opens, not with a song, but a long poem being recited by Larry (with a Cockney accent) during a concert in Hollywood. Someone in California emailed me yesterday, asking about the words to that poem, entitled "First Day In Church". I don't have the words written down anywhere, nor could we find them online. However, I sat down and did a stream-of-consciousness writing from memory, and I think I've got it (mostly) right. At any rate, it's a window into my earliest influences as a new Christian. We sat in what they call a "pew"
You shoulda seen their looks! "These books is fer the birds"
"Shhhh! Tsk tsk tsk tsk!" "Oh do hush up, you make more noise than us"
"Colored windows like me granny's, at the bottom of the stair..."
"Shut your face," I says to Sam, "I'm be listening"
And Sam says, in a puzzled voice, "Coo, they've all got nighties on"
"And they dare condemn us for the way we choose our gear?" It's like "mumble, mumble, shifting sinking sands"
"Son, Jesus came to help young men like you"
Is Christ a myth? A madman's whim? Is there a way to contact Him? Or will I die not knowing how?